The Windproof Style Smock from Web-Tex is clearly based on the very popular, and very practical, SAS Smock design - John Fenna sees if it's as tough as the original. This smock is made from a tough and quiet ripstop polycotton fabric. 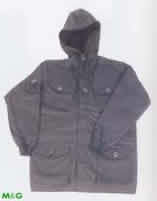 It has all the features you would expect from this kind of garment, including: a fixed fully lined, generously sized hood with a locking front hem drawcord and a rear volume adjuster, a chunky full-length double ended front zip under a generous, Velcro tab closed storm flap, as well as a generously sized drip strip behind the zip. Other features include a waist drawcord adjusting at the sides, and a hem drawcord fastening at the front. Both elbows and shoulder yoke area are double thickness for durability and weather-resistance, and the fabric's initial water repellent qualities can be renewd with Nikwax wash-in products. The smock has ample pocket space with four bellows style front pockets, all with "envelope" type secure and weather-resistant, flap-covered openings with slotted '95 pattern buttons (though sewn with one attachment point only). The chest pockets are set at a slant for ease of access, while the huge lower pockets are set square to the jacket hem. Inside the smock there is a single, free-hanging, open topped pocket inside the left chest and twin, open topped "poacher's pockets" in the smock's lower back panel. The left sleeve has an angled pen pocket, the right sleeve a box style field dressing pocket, both having '95 pattern buttoned flaps. The military origins of this jacket are obvious when you see the button-fastened front rank slide. The smock has soft and comfortable knitted elasticated cuffs, which are more reminiscent of a para smock than an SAS smock. The fabric is tough and hard wearing, as well as quiet to wear and shower resistant, although the cuffs tend to hold water and are slow to dry once wet (wash-in proofings help here! ), but overall, the smock is very practical and comfortable. Its general styling is a popular, well proven design, while the knitted cuffs add a cosiness factor not found on similar design smocks with Velcro or button cuffs. I quite often choose this smock to wear rather than others of a similar type on the basis of its "cosiness" and, as my sample is in black, its non-military appearance. For those who want a cammo smock, Web-Tex produce an identical smock in British DPM and one in 100% lightweight cotton in Desert DPM, which seems an effective cammo in reedbeds or cornfields. The Web-Tex Windproof Style Smocks come in a full range of sizes and cost around £65. This article appeared in the June 2007 issue of Gun Mart, and is reproduced here with permission. 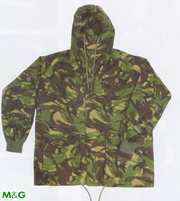 You can buy Webtex SAS Style Smocks directly from this site.